OPW, a Dover company and a global leader in fluid-handling solutions, has announced the launch of the new www.opwglobal.com. 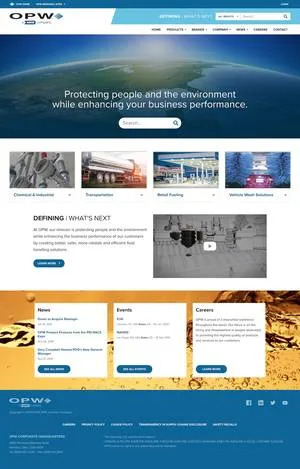 Easy to navigate, mobile responsive, and elegantly designed, the new website embodies OPW’s commitment to defining what’s next across the globe with fluid handling including vehicle wash solutions. The enhanced design of the new website introduces a series of helpful features and offers a superior experience for new and returning visitors. It also includes an expansive resource library complete with technical guides and training videos. Additional features include improved navigation featuring a more intuitive menu system, improved search to allow you to more easily search by the type of content you need, and the ability to filter search pages to narrow down and refine results.